According to the Memorial’s Director, Brendan Nelson, in his foreword to the excellent catalogue, the works in Reality in flames ‘explore both the dangers soldiers faced abroad and the challenges war brought to the home front and to Australian society itself’. The Director’s recognition of these three dimensions – reality of war, home front and aftermath/impact – is refreshing, given how narrowly focused on military memorabilia is so much of the Memorial’s product and so much of the Director’s own promotional work. The breadth of Reality in flames was particularly noticeable on the day this reviewer saw the show because it was also the day the Memorial paraded its ‘big toys for boys’ – sorry, Big things in store – collection at its Mitchell warehouse, where the emphasis was on materiel ‘used by or against Australian soldiers’. Great stuff for the kids and the dads but, as a way of obtaining a broad appreciation of war, about as useful as a collection of front pages of Pix magazine would be for grasping Australian popular culture in the 1960s: all gloss and hints of danger but with the business end and the consequences well-hidden. Reality in flames is well organised under headings which show the range of its coverage: the aesthetics of battle; men and women in war; a spirited time; new experiences, exotic and alien; exodus, imprisonment and death; building another world. There are also informative panels explaining futurism, cubism, surrealism and social realism, plus some notes on contemporary art movements and the Angry Penguins fuss. Some of the artists contributing were official war artists, others were enlisted service people, some were both. A number of the artists evoke echoes of their ‘civilian’ work. Colin Colahan’s ‘Waterloo Station’ (1945) and ‘Victory parade’ (1946) remind us of his ‘Elizabeth Street, Melbourne’ from 1929, Donald Friend’s ‘Crowds dancing at King’s Cross, 1945’ eerily foreshadows his later Bali work, and John Brack’s ‘Soldiers’ from 1945 reappear in the 1950s bustling home down Collins Street. 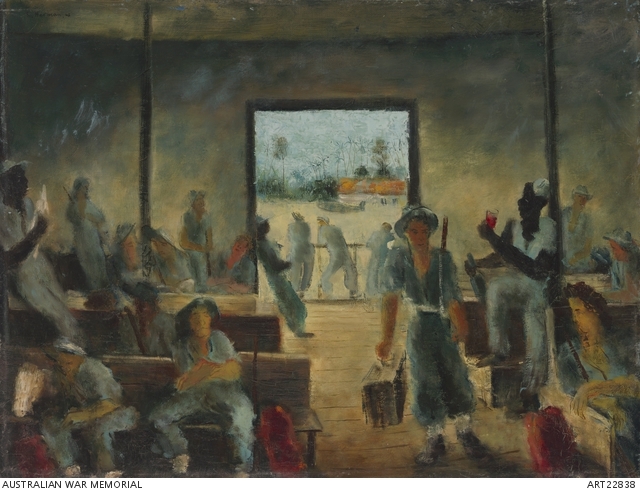 The works that stood out for this reviewer, however, were Nora Heysen’s ‘Transport driver (Aircraftwoman Florence Miles)’ an oil from 1945, all strength and thousand yard stare, perhaps remembering lost friends, the young Sidney Nolan’s irreverent ‘Dream of the latrine sitter’ (1942), and Sali Herman’s ‘Waiting room, air transport, Finschhafen’ (1945), a room that the reviewer’s father probably passed through more than once. Noel Counihan’s ‘A soldier on leave’ captures the stresses on both serviceman husband and also-serving wife. Less remarkable, though frequently reproduced, is Stella Bowen’s ‘Bomber crew’, which looks like a piece of Nine Network cricket memorabilia. This reviewer saw it used as a prop in a sanitised ‘Hands on History’ presentation for primary school children visiting the Memorial. Two pieces of sculpture also demand a close look. There is ‘Native head’ by official artist Ralph Walker from 1949, showing the elongated skull (produced by binding during infancy) of the subject, a member of the New Guinea Infantry Battalion. Then there is Daphne Mayo’s ‘Two jolly sailormen’, from around 1944, a curved masterpiece in miniature with the only straight lines forming the arm of one drunken tar clutching a couple of bottles. You expect these tiny figures to topple at any moment off their plinth and go reeling away through the corridors of the Memorial. The great majority of the exhibits in Reality in flames do not show shots fired in anger or men dying in agony. The works in the sections ‘Building another world’ and ‘Exodus, imprisonment and death’, in particular, show how capable the Memorial is – when it puts its mind to it – of lifting its eyes from yet more sentimental celebration of Aussie blokes in khaki doing and dying or pieces of antique artillery, to look instead at what happens to non-Australian civilians in horrible circumstances or at how broken people try to patch themselves up after a war. One wonders what will happen if another Vignacourt-style collection comes to light, with photographs of haunted (or just goofy) Diggers staring at the camera. It would be a mark of the Memorial’s maturity if it thanked the donor profusely, muttered ‘been there, done that’, then locked the donated collection in the Mitchell warehouse for a decade and turned its attention instead to augmenting its collection of material about non-Australians, non-soldiers and events far away, geographically and chronologically, from the sound of the guns. All in all, Reality in flames is thoughtful, diverse and subtly subversive of the received or mainstream version of Australian war commemoration. 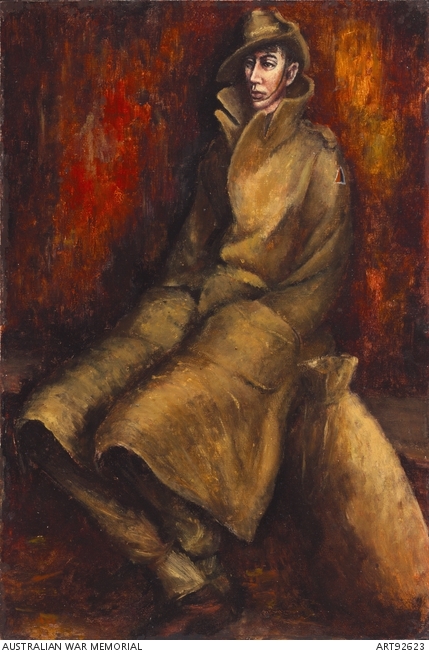 This reviewer was struck by the contrast between the paintings of Albert Tucker and, heard in the distance from the World War I galleries, the voice of a young woman singing about her grandfather, ‘Arthur Tucker was his name’, killed in World War I. Downstairs, a clever artist wrestling with complex themes (death, evil, mental disintegration, the occupation of Japan) and repaying sustained study; upstairs, a sentimental and banal – if well-meant – ditty, repeating every few minutes on the basis that people would be moving rapidly through the space. Reality in flames is a credit to the Memorial’s art team who put it together and to the Memorial’s management who blessed the exhibition. The pity was that, on a Saturday afternoon, with the rest of the building reasonably well populated (plus the crowds out at the Mitchell warehouse kicking tyres and calculating throw-weights) the exhibition was virtually empty. ‘It’s a shame that this display doesn’t get the attention it probably deserves’, one visitor was overheard to say. No ‘probably’ about it, sir. Meanwhile, across Lake Burley Griffin at the National Library there is Heroes and villains: Strutt’s Australia until 15 November. William Strutt (1825-1915) lived to a great age and spent only a dozen years in the Southern Hemisphere. He arrived in Melbourne in 1850 – on the same ship as historian Graeme Davison’s great-great-great-grandmother – just as Victoria separated from New South Wales. That Melbourne is magnificently represented in the exhibition by a massive blow-up of an 1858 photographic or daguerreotype view down Bourke Street from Spring Street. Readers who have swept around that corner on the number 96 tram to St Kilda Beach will know the vista well. Strutt’s first patron was John Pascoe Fawkner, the el capo of early Melbourne, who appears in a couple of rather smug-looking Strutt portraits, along with Mrs Fawkner with a flower behind her ear. There are also some delicate pencil and watercolour sketches of long-forgotten Melbourne folk of the 1850s, a large equestrian oil of a General Macarthur, and some small oils of some beautifully mounted and luxuriantly bewhiskered policemen. These were Strutt’s meal tickets, the work he did to put bread on the table. There are also a few works from his short stay in New Zealand later in the 1850s. Ironically, much of Strutt’s ‘Australian’ work was done after he returned to England in 1862. He never came back to the colonies but spent the rest of his career in England, making a living from doing mostly undistinguished pictures of Biblical subjects and animals. Yet, his mind’s eye kept returning to Australia and some classic Australian themes. ‘Bushrangers, Victoria, Australia, 1852’ was painted in 1887 and based on an incident in St Kilda Road, Melbourne, not long after Strutt arrived in the colony. We don’t see the bushrangers’ faces clearly (though we guess they are the forerunners of generations of ‘lovable larrikins’ since) but the expressions on most of their ten or so captives are meticulously rendered. There is resignation, disbelief, fear, worry, even boredom. Perhaps the banker type is trying not to draw attention to the sovereigns sewn into the lining of his frock coat. Meanwhile, a cat peeks from a wicker basket, the young man has a button adrift on his weskit, his young lady has fainted quite away, and the horses look on quizzically. The painting is accompanied by dozens of preparatory sketches. ‘Black Thursday, February 6th, 1851’ was painted in 1864, not long after Strutt and his family returned to England. It is a monster oil, about five metres long and almost two metres deep. (Its size was presumably part of the reason why it languished in Strutt’s studio for a couple of decades, before finding its way to Australia, being parked in a back room for another long period, then finding a proper public home for the last 50 years in the State Library of Victoria.) There are dozens of people, animals and birds in the foreground, yet our eyes are drawn to the hero in the middle on his horse, with rescued damsel a-swoon in his arms, the young man a role model for young Englishmen and colonials alike. The hero’s horse’s eye seems to reflect ‘a sky the colour of mahogany’, which makes up the top half of the painting and brings back memories to today’s visitors of many more recent fires. Fires smelling of eucalyptus have surely shaped Australians just as much as have battles carrying the whiff of cordite. Strutt’s portrait of Robert O’Hara Burke received a lot of publicity when the exhibition opened because Australian-actor-from-Central-Casting, Jack Thompson, had taken some inspiration from it when portraying Burke in a movie or mini-series. The painting certainly captures something of the man Burke (though the camel at his feet looks stuffed). Strutt saw the Burke and Wills exhibition leave Royal Park in 1860 and must have looked into the mad eyes of his subject in order to render them so hauntingly in the portrait. The exhibition also has a number of sketches and watercolours of the party leaving Melbourne and a video includes the well-known and beautifully realised watercolour portrait of William Brahe, one of the more level-headed of Burke’s large and ill-suited crew. Disappointingly, Strutt’s large oil of the burial of Burke at Coopers’ Creek is stilted and wooden and not a patch on Sir John Longstaff’s ‘Arrival of Burke, Wills and King at the deserted camp at Cooper’s Creek, Sunday evening, 21st April 1861’, which hung for many years in the old newspaper reading room of the State Library of Victoria, giving this reviewer as a youngster considerable food for thought (and the occasional nightmare) about the perils of the bush, another perennial Australian theme. Still, Strutt was 86 when he painted his Burke and Wills clunker so perhaps we should not judge him too harshly. (Unlike this failed oil, the watercolours of Strutt’s dotage retain the freshness and vibrancy of those of his youth.) The video includes an interesting photograph of some English gents posing for the Burke burial painting, plus a rather fetching miniature of Strutt himself. He was a handsome young man. Next door to Strutt at the NLA is a small exhibition, Portraits of the famous & infamous: Rex Nan Kivell collection, which runs until 13 December. Rex de Charembac Nan Kivell of London and Sydney started off as Reginald Nankivell of Christchurch, New Zealand, which would immediately have put some people on their guard. 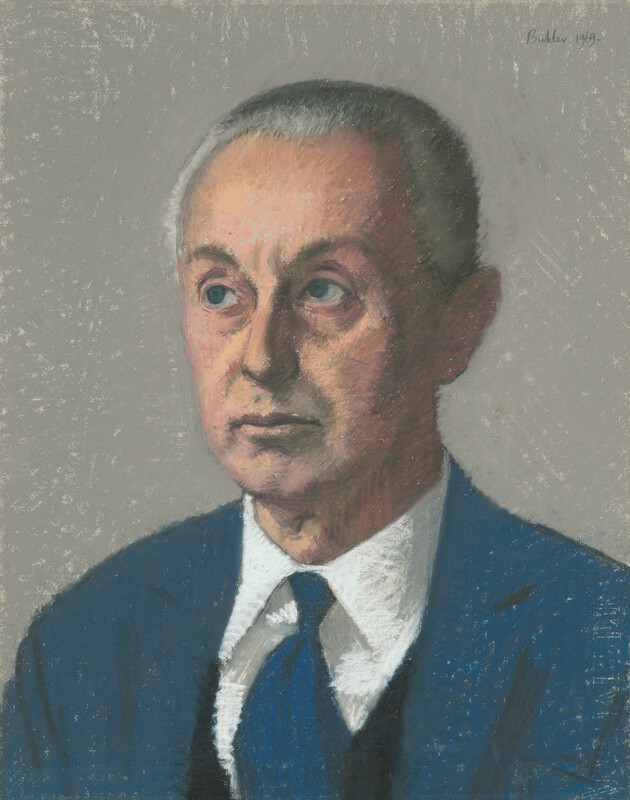 But Reg/Rex’s obsession with collecting portraits of people ultimately garnered thousands of works for the National Library and 500 of them appeared, listed A to Z, in a book published in London in 1974. A few dozen of Nan Kivell’s bounty feature in this exhibition and the standouts are a portrait of the man himself, in a 1969 pastel by Robert Buhler – Reg/Rex looks rather mysterious and not unlike BA Santamaria, a startling face circa 1834 of Kalaimanokah’owaha by John Webber, and some nineteenth century sporting lithographs of the sculler Laycock, the boxer Tom Curran, and ‘Johnny Day, the pedestrian wonder and champion of the world’. There is also a portrait of a gentleman with the odd name of ‘Possibly George Barrington’. The writing on the wall at these exhibitions is always mordant and instructive. As you go into the Strutt exhibition you read this, from Strutt to James Smith in 1861: ‘It is lamentable to see men of true genius wasting their powers on twaddling little sujets de genre [genre subjects] when the pages of history offer such an abundance of splendid subjects’. Strutt was arguing for curiosity and innovation in art but it is not a bad sentiment for museum curators, cultural policy wranglers and all of us to keep in mind. We needn’t get defensive about whether our life’s work deserves the adjective ‘twaddling’ – it means ‘silly’ or ‘tedious’ or ‘trivial’ and works just as well as a noun or verb; we just need to be ready to keep riffling history’s pages looking for new material and new possibilities. There will, for example, always be old women of all genders who question whether Dr Bean would have approved of new directions at the War Memorial; such people should be locked in the warehouse along with the Digger photographs.